This is a review of Autumnation, a seasonal beer made by Sixpoint Brewery out of Brooklyn, NY. Before I get to the beer itself you’ll have to forgive me for going off on a rather long tangent on how I came to buy this beer. So the 2012 version was a wet hopped, pumpkin beer brewed with ginger. Does that sound like a combination that works well together? It’s true that hops and pumpkins are both harvested in the fall, and there is a certain line of thinking that would lead one to think that’s enough. I used a similar faulty logic many years ago to justify adding tequila to guacamole on the premise that cuisine and liquor from the same country must complement each other. As my wife would gladly tell you with very little prompting, the tequila/guacamole experiment did not have a happy ending. 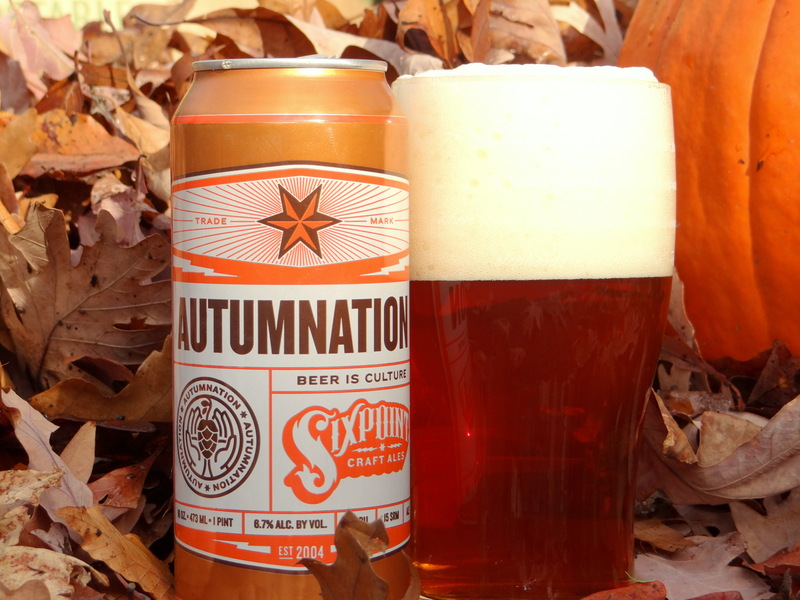 From reading reviews on the 2012 batch of Autumnation, Sixpoint experienced a similar fate with last year’s batch of Autumnation. So this year they decided to ditch the pumpkin and ginger and just make a fresh hop beer. A good decision I think. There is one more twist in the Autumnation story. The variety of hops they use for wet hopping are chosen by “their fans”. Presumably this means there is an online vote and the hop style that gets the most votes is used. This year Mosaic hops were the winner, while in 2012 Citra hops were used. I did love the use of Mosaic hops in Alchemy Hour by Great Lakes Brewing last year (and renamed Chillwave for the coming year I just learned), so I had high hopes for Autumnation. What about the quality of this year’s batch of Autumnation. As you see from the picture above (inspired by the Autumnation picture posted on Bryan Roth’s Beertography post ) it pours a deep copper color somewhat darker than the can it comes in. There is a massive thick white head on this beer that recedes in an uneven fashion that leaves behind of big chunks of head and extensive lacing. There is a juicy, fresh hop aroma, but you have to look for it. Compared to the best wet hop beers I’ve had this year the nose is pretty tame. Hops are at the fore of the taste, but they give a somewhat generic hop profile. By that I mean they give roughly equal amounts of citrus, floral, and pine flavors. There is a nice hop-malt balance, and the bitterness is middle of the road for an IPA. Overall Autumnation is a pretty good beer. I’d take my chances with it vs. the best squash beer on the market, which may be like saying Autumnation is better than nothing at all. Their decision to take pumpkin and ginger out of the recipe makes a strong case for the “less is more” approach. If I were to rate against other 2013 wet hop beers I’ve tried, I would say it does not measure up to Founders Harvest Ale or Columbus Brewing’s Fresh Hop beer, but it is way better than Hopivore by New Holland Brewing. I made the same mistake as you! I bought a four-pack of this while I was visiting friends and did a quick search for the beer on my phone, apparently ignoring the “2011-2012” part of search results. All the same, I’ve also liked this one. It’s made for a nice fall 1-2 punch with Sierra Nevada’s Celebration. Nice to know I’m not the only one to get confused.